Pastrami is cured for five days, smoked for ten hours, steamed for 3 hours, and then hand-sliced. When you walk into Kenny & Zuke’s Delicatessen (1038 SW Stark St), you feel like it is the quintessential Jewish deli. 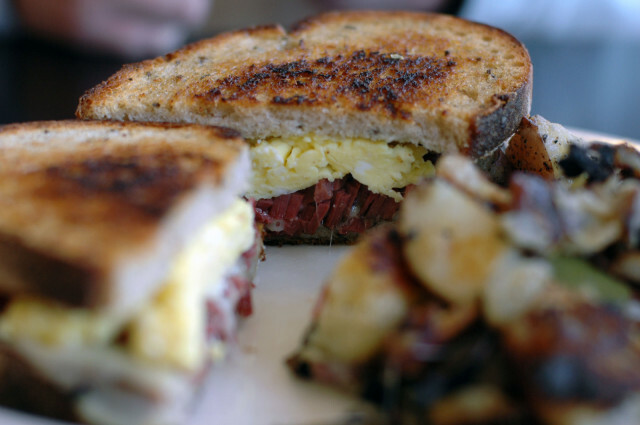 They have sweet mouth-watering Jewish pastries, bagel and lox, challah French toast, and in-house hand-sliced pastrami. This restaurant was featured in our 2009 Top Burgers package, B is for Bacon…and Breakfast guide to Portland’s best breakfast, and The Art of Eating Cheaply. And while I want to fight this non-kosher menu tooth and nail, I can’t. Kenny & Zuke’s food has never fed me wrong, and I know the tapas dinner will be delicious. With a plentiful supply of fresh sangria, how could it not be? Tapas Dinner Sunday, March 28th, seating at 5:00 and 7:30.